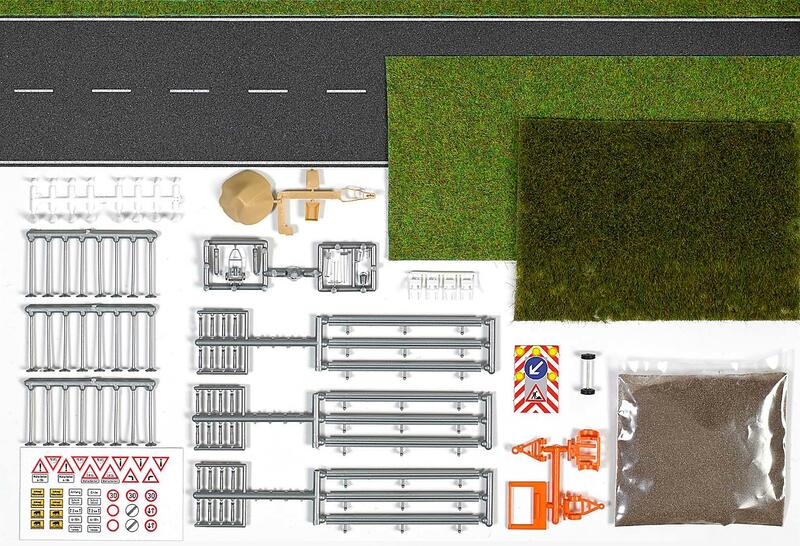 80 cm road including grass mats and lots of accessories for the design of a typical scene for the maintenance of roads and maintenance of green stripes. Ideal supplement to the new Unimog vehicles with mower. Content: 80 cm self-adhesive asphalt road (for straight roads, not flexible) Sand, matching green stripes as a "cut grass" (2 pieces 40 x 11 cm) section with long grass for uncut areas (14.5 x 10 cm), guard rails, Pile of sand, wheelbarrows, traffic cones, welding machine, tools, building Lightning Pendant (without light) and shields.